Instilling a love of language and drama in children. 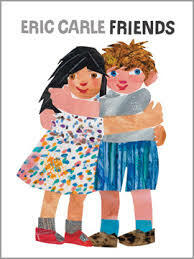 This is a great self contained lesson with a focus on friendship and has the lovely surprise of kids finding common ground with classmates. Lovely for kids in PP – Grade 2/3. I begin this lesson with some warm ups, getting kids to move around and working with lots of different people. Face to Face is a great one to begin, leading into Knife and Fork where they make different quick formations with a partner. I begin with concrete objects then get them into creating frozen moments in pairs, showing what friends like to do together. This is a physical brainstorming activity and works really well. Gather the kids and show the cover of the book – take this opportunity to chat about the style of illustration (collage) and discuss Eric Carle – a few kids will recognise the style and realise it’s the same author as “The Very Hungry Caterpillar”. Opening it up to the title page with the bouquet of flowers, ask kids what they think the significance of the flowers could be – you’ll get some great ideas and thoughts. Read the book, showing the illustrations. No interactions needed during this reading. Afterwards, do a guided narrative pantomime. All the kids find a partner and as you read they will mime out the story. When the friends separate, early on, they both become the main character, regardless of gender. Encourage them to just focus on their own movement and not to interact with others. In the end, as the story describes, they will end up back with their original partner. Kids love doing this – it’s a safe and fun creative play exercise. Debrief asking which parts they enjoyed most. The class then sits in a large circle. Explain that they will do a living picture. Each student entering the circle saying “I like playing_____________with my friends”. They show it and then freeze. As kids get an idea, they raise their hand and you invite them to join in the living picture. End with all are in or ideas have run dry. Last activity is the opportunity for kids to work together and perform. This is the structured performance, modifies, as used with many of the other books on this blog. In groups of 4 or 5 kids come up with a performance where the group will stand in a line beginning with “We love playing with our friends (in unison)”. Then one child steps forward with their contribution, but the whole group then acts it out (can be mimed or with voice). In between each idea, the whole group repeats “We love playing with our friends”. They also end with this. Kids only need about 5 minutes to prepare it. The strength of this exercise is that every student contributes, they all have the opportunity to speak and the group needs to work well together to create a polished performance. This entry was posted in Picture Books to Use and tagged children's book, drama, eric carle, friends, group work, literacy, narrative, pantomime, picture books, primary drama, speaking, structure, young children. Bookmark the permalink.